From hospitals to small clinics, we continually hear this concern from all types of health-care marketers. Thanks to the internet, the patient journey is “going digital”—especially during the research phase. Patients are better informed and empowered than ever before, and choosing a clinic or physician is nearly as transparent as car shopping. The health-care marketer’s role is to meet educated patients halfway, provide useful information, and use new tools to improve both the access and the quality of health care. While our digital marketing strategy for each medical partner varies, every goal involves optimizing three areas of patients’ digital journey: search, mobile, and social. Focusing on these areas allows us to understand which digital influences drive a prospective patient to choose a hospital, clinic, or physician and to identify and overcome any potential roadblocks to making an appointment. As patients continue to use digital resources to connect, learn, and ultimately make decisions, companies and marketers will be pressed to find the most economical ways to connect with patients, and the digital channel provides ample opportunity to do so. Let’s start with the raw numbers and work our way to the marketer takeaways. The web plays an integral role from the very beginning of the patient journey. Think about your last medical-related search—it likely involved using Google to search for a few symptoms to help make your own preliminary self-diagnosis. In fact, 86 percent of patients conduct a health related search before booking a doctor’s appointment. Nearly 80 percent of those health-care seekers used a search engine (Google, Bing, Yahoo) to conduct research, whereas about 13 percent said they went directly to a site that specializes in health information (e.g WebMD, Mayo Clinic) to conduct their search. Think that Dr. Google is only reaching younger patients? Considering the elderly compose a large segment of the patient base—it’s not an audience a marketer should ignore. As you would assume, seniors aren’t as active online as younger generations are, but surprisingly, a large percentage would like to be able to make appointments and fill prescriptions online. What are seniors doing online for their health? When prospective patients aren’t self-diagnosing or looking up exactly where a clinic or hospital is located, they’re comparing the legitimacy and reputation of facilities and whether their health plan is accepted. When patients aren’t searching for symptoms–here’s what their researching. 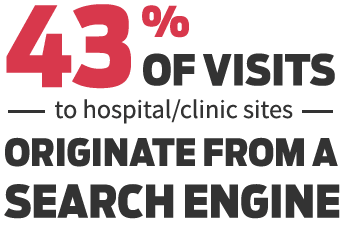 As evidence that patients are more informed and empowered than ever before—prior to making any decisions, nearly half (48%) of all patients spent over two weeks researching health-care providers online—with 61 percent visiting more than two hospital/clinic sites before converting. Additionally, patients who booked appointments online spent three times as long researching providers and their competitors than did those booking in person or over the phone. When patients make a decision, one in five books that appointment via computer or mobile app/browser compared with 50 percent who call on the phone and 23 percent who book in person. Researchers believe that digital booking will continue to grow, eventually eclipsing both in-person and over-the-phone methods. Patients booking appointments tapped into the following resources when researching online. Paid search ads actually do matter in the health-care space, which is surprising considering they’re quickly becoming ignored and obsolete throughout many other industries. This contrast may partially be due to the age of the audience searching for health-care information, with the conclusion being: the older you are, the more likely you are to research physicians, hospitals, and clinics. Also, research demonstrates that as age increases, so too does the tendency to click on a paid search result—18 and under only click PPC ads 5 percent of the time, whereas the 55 and over crowd clicks on them 23 percent of the time. What happens after a prospective patient encounters a pay-per-click (PPC) ad? Patients are researching and booking appointments across a wide range of devices. In 2013, just over 56 percent of Americans owned a smartphone, and 34 percent own a tablet computer—and believe it or not, roughly a third of patients used those devices daily for research or appointment booking. It makes sense: our phones are a constant research companion, always available to verify an address, Google a symptom, or find out what your new cardiologist looks like. In fact, many patients admit that they’re researching symptoms, providers, and physicians up until the moment the patients’ names are called in the waiting room—stashing their iPad away and armed with questions and concerns fresh in their mind. While we all can see the rise, and eventual dethroning, of the desktop by mobile devices, it is somewhat surprising to learn that one of the fastest growing markets for tablets are people ages 65 and older—with a 15 percent growth from last year. After an initial learning curve, many older Americans report they prefer surfing with a tablet because of the easy magnification features and overall more intuitive nature when compared with a desktop experience. Social media has reached the point at which people, mostly younger generations, feel comfortable sharing personal information and interacting with others with similar symptoms or diagnoses. Social networks are built from relationships and trust—but misinformation abounds on services such as Facebook and Twitter. This may be one of the many factors affecting why many wholeheartedly trust information found on social networks about health care. Social media provides a valuable opportunity to build trust, increase practice transparency, and connect with millennials. Health-care marketers have an obligation to create quality educational content to be shared across social media that will help accurately inform prospective patients about health-related issues and overshadow misleading information. Despite the many regulations as to what can and cannot be said on behalf of hospitals, 26 percent of all hospitals in the United States actively participate in social media. With over 25 percent of conversations on Facebook being about a health-related experience or update, social media is proving to be vital to connect with past, present, and future patients. While prospective patients rarely convert based on a single Facebook update from a hospital or clinic, social media has proven to be a powerful tool to improve facility transparency and authenticity—leaving your brand on their minds when making decisions. Today’s health-care marketing requires both offline and online strategies and needs to address the increasing segment of engaged, proactive patients. Have you covered all your search paths? While search paths originate with symptoms and conditional terms, nearly all patients finish their paths with a branded term. Could it be your business? Do you provide patients an easy way to book appointments online? Do you have a PPC strategy? How are you addressing the search needs of your target persona markets (e.g., seniors, boomers, and millenials)? How does your site look and function on a phone or tablet? Are you prioritizing information and effectively making strategic choices about elements’ shifting and repositioning for each various screen size that viewers could potentially visit? Are you catering to the savvy seniors? Could your web presence use a responsive or mobile-first design—or maybe even a dedicated app? Do you have a social media strategy and/or guidelines? Do you create professional, educational content that is worthy of sharing? “Health Online 2013,” Pew Research Internet Project. “The Inside Look at the Boomer Healthcare Consumer,” Google/Nielson Online/Sterling, U.S., September 2010. “The Digital Journey to Wellness,” Google/Compete, 2012. “Organic vs. 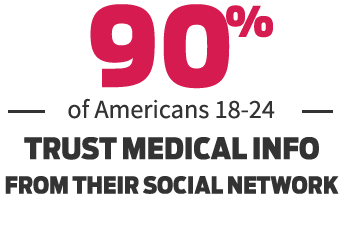 Paid Search Results: Organic Wins 94% of the Time,” Search Engine Watch. “Smartphone/Tablet Ownership 2013” Pew Research Internet Project.